I built this computer a couple years ago and I was happy with everything except the look of the interior. I didn't like seeing the wires under the PSU and the wires going into the GPU card, (Why won't anyone design a card that has the connectors in a less conspicuous place than right on the outside edge?) so I came up with the idea of making some non conductive shielding to both hide the wires and direct the airflow a little more than the stock case (which already had great airflow). I decided I wanted to fabricate some custom carbon fiber and polished aluminum covers to help hide the wires and dress up the interior a little bit. I first made some templates out of some card stock I use for printing by cutting and folding and taping with masking tape to allow the tape to be moved and reapplied while using trial and error to create the shapes needed until I was happy with the look. I then purchased some sheets of polystyrene (Black Styrene Sheets, .04x8x21") and some metal tape (3M Foil Tape 3381 Silver, 1.88 in x 50 yd 2.7 mil (Pack of 1)) and some carbom fiber decal sheets (3M Scotchprint 1080 Carbon Fiber Vinyl Flex Wrap Black CF12 60"x12"). When the styrene arrived, I marked out the templates I had made onto the plastic and cut the pieces out. I glued them together with model glue (Testors Plastic Model Glue) and let them cure before covering them with the carbon fiber wrap. I then added the metal tape in small strips I cut from the roll onto the edges of the covers. The covers were then fit into place (they are held in by friction fit and are easily removed for cleaning out dust) and the case was closed back up. I monitored the temperatures over the next few weeks and they had dropped slightly on the GPU(4° F) and the CPU(5°-6° F) presumably due to the more controlled air flow patterns. If you have any questions, ask away, I am happy to help you if you like this project. Well you got to plug in to the vid card somewhere. Using a modular PSU and a case that is designed for cable management like the Antec P280 would have been a lot simpler. Those temps are insignificant. Temp drops of 10 to 15 F are something to brag about. That was an awful lot of work to have such minor rewards. How about some pictures of the finished product. That CAD drawing doesn't show anything of value. It looks great if you ask me. At least from an aesthetic standpoint. But yes modular psu is the way to go if you want good cable management. That PSU in the specs is modular, I don't know why you thought it wasn't. I only connected the cables I use, no extras, but they were still visible. I don't like adding more distance to any connector than is necessary, so I wouldn't want to move the GPU, and as for breathtaking, lol I don't think that's possible for me, no computer is breathtaking, that honor goes solely to my wife. I just want the inside to look uncluttered, and that is what I achieved with this mod. Thanks for the kind words, I like the way it looks now too, and I did my wife's in a similar way, but the GPU cover is wider in hers to help with even better flow and looks and it was a simpler design. Hers is purple (Purple Myst) mine is Blue Lightning, and the kids have Green Dragon and Pink Pony and we all have a wallpaper to match. lol I wasn't bragging, just stating a fact, I was concerned that the temps might go up a few degrees and was happy they didn't and I even got a bit of a boost too, so it was a win-win. Any temperature decrease is significant to me though, even 1 degree. 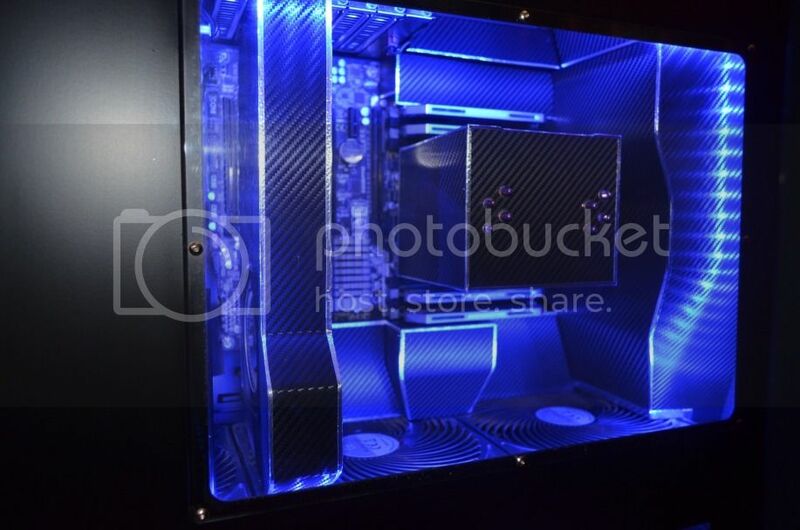 The Antec case, while being a lot cheaper in build quality and cost isn't anything I would want to have sitting on my desk. I like the convenience of all the connections on the top and the air all moving from bottom to top. I also don't like doors on a computer face. The case I chose is the best for all the things that mattered to me, cost was not a consideration. The 100.00 I would have saved with the Antec is insignificant in this build because I will keep this case for my future builds too. I have used a lot of cases and this is by far the best I have ever seen. That is for a small case and not for the case I have, it's rather large. Besides, then I'd have to make a cover to hide that bus too, counterproductive and then you also have doubled the possible points of failure at connectors, it would be a very bad choice when I just wanted to hid wiring. No, the way I solved it was superior in many ways to that solution. The picture looks like a drawing. If it's a photo, would you turn on the lights and take another picture? The lights are on. Inside and outside room lighting.